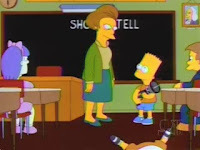 Though she appeared way back in season one, this is one of the first episodes to reference Principal Skinner's creepy, Norman Bates-esque relationship with his mother. The writer of this episode, Jon Vitti, worked on Saturday Night Live, and the Tuesday Night Live bit with Krusty in the "big ear" family was his way taking a subtle poke at the show. Lisa's obsession with teen hearthrob Corey is, of course, a reference to the "Two Coreys" madness that swept through young girls back in the 80s, when the Coreys Feldman and Haim were hot stuff. This episode is filled with tons of pop culture references, from the aforementioned SNL bit to The Shining, the song "I Am Woman", The Flying Nun, Ren & Stimpy, Who's Afraid of Virgina Woolf?, The Public Enemy, and The Quiet Man. 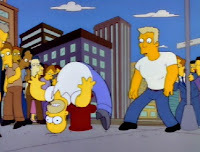 Homer: Hey, boy. Where ya goin'? Administrator: And what are your reasons for wanting a Little Brother? 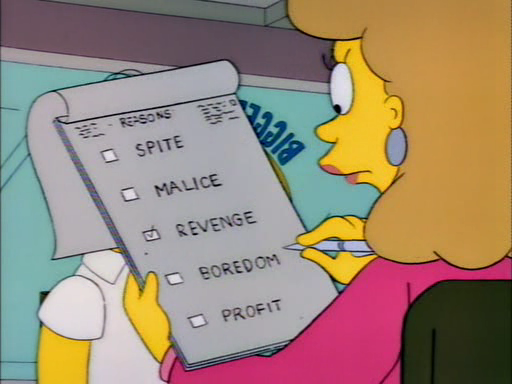 Homer's Brain: Don't say revenge! Don't say revenge! Homer's Brain: That's it, I'm gettin' outta here. Pepe: Tell me more! I want to know all the constellations. Homer: Well, there's... Jerry the Cowboy. And that big dipper looking thing is Alan... the Cowboy. Pepe: I love you, Papa Homer. Homer: I love you, too, Pepsi. Tom: You know, the whale is not really a fish. They’re mammals like you and me. 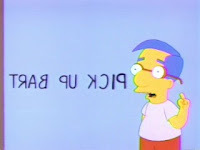 As someone whose mother was often interminably late on the occasions when I needed to be picked up from school back in the day, the opening of this episode has always resonated with me (especially the bit where Bart recognizes a car he thinks might be Homer's; I used to hate station wagons that weren't my mom's for that reason...). It sets up another classic episode, as Homer and Bart both defraud a charitable non-profit organization just to spite each other, and their relationship gives the episode a solid emotional foundation on which to build the ensuring hijinks (nicely capped off when Homer and Bart's little and bigger brothers get matched up, helping atone for the Simpsons' misuse of the organization). 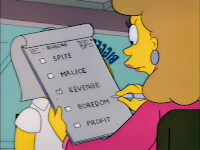 Lisa gets some solid material in the B-plot, as she struggles with her addiction to calling the Corey hotline and listening to the heartthrob list off words that rhyme with Corey ("allegory"), and the whole thing is capped off by one of the most dynamic fight scenes in Simpsons history, one which was clearly an inspiration for the infamous Peter/Giant Chicken fights on Family Guy. Yet another strong turn for Phil Hartman, filled with tons of diverse pop culture references and featuring a strong emotional core with some truly spectacular gags. "This is even more painful than it looks." I feel like this episode gets missed when talking about classic episodes, but it is really good. And Homer becoming a big brother for "revenge" reminds of the Seinfeld episode where Jerry tries to return a coat out of "spite." It was a great episode, I must have seen it at least 3 or 4 times. Those old Simpsons seasons were sooooo good. @Dr. Bitz: I feel like this episode gets missed when talking about classic episodes, but it is really good. Funny that you mention that. Before re-watching it, I remember thinking "oh, here's our first step down from a Five Head out-and-out classic in while". 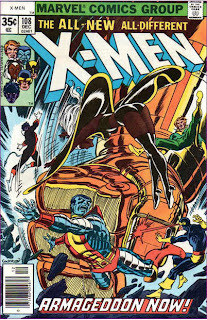 Then I watched it again, and realized it's just as much a classic (and just as good) as the episodes around it. I'm not sure why it gets overlooked; maybe because there's a lot of great visual gags, which don't translate as well into quotability (though I had to work hard to cut out some quotes from this post)? @Arion: Those old Simpsons seasons were sooooo good.